It was breakfast time on Easter Monday, and Tanya had organized a group of 11 of us to come out to a hotel restaurant armed with vouchers to eat a buffet breakfast. It looked like we had all eaten our fill of eggs, bacon, fruits, cereals, yoghurts, and whatever other breakfast foods lined the tables of Copthorne Hotel’s “one80” restaurant. 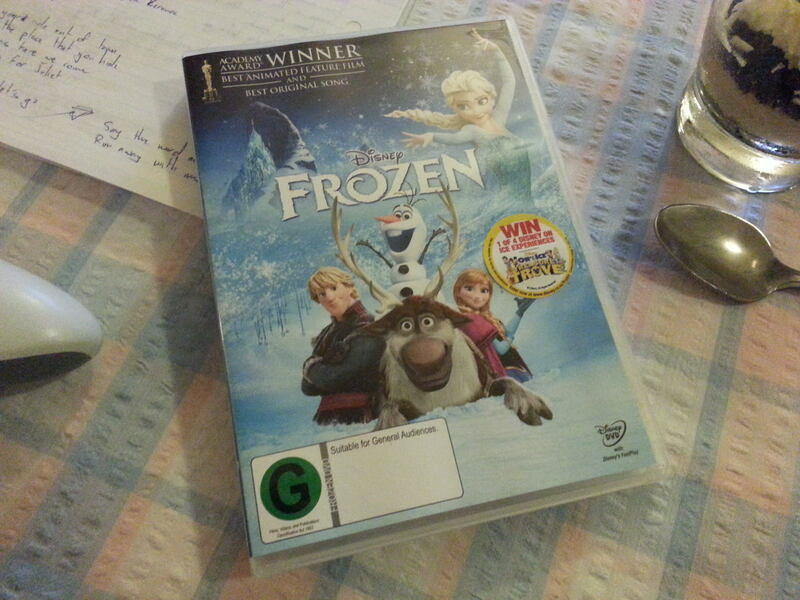 Somehow, talk had moved to movies and Frozen, and I took the opportunity to tell stories of how I’d sing lines from that movie in work situations. Compared to the few musician friends I have, I don’t really think of myself as a hugely musical person. I’ve got some music in me - I’ll sing along on road trips, I can play piano (very basically) and guitar (a bit more than basically), and I really enjoy musicals - but only ever enough to keep it firmly planted in hobby territory. Every now and then though, a little bit of that hobby will seep through the walls that divide reality and my mind, and I’d find myself humming along to a tune, or mouthing the words to a song in my head or playing through my headphones as I walk to/from work or in any other public situation. Those actions I described are really just residual effects borne out of the frustration that what I really wish would happen is for people to break out in song and dance on random occasions. I know, I know, it’s probably just me that wishes that. I’ve been too caught up with Disney movies and musical theatre and the occasional episode of Glee over the years that it’s kind of skewed my expectations of how much music is actually inside each and every one of us. Not every person wants the world to know how they feel through verse and chorus, and not everybody wants to express themselves through song and dance. It’s a little sad though, isn’t it? Music is such an emotionally-charged thing, and if people have no music in them, then does that mean they’re also lacking the emotion to go with it, or are holding on to those emotions maybe a bit too tightly? That’s one of the lines of thought that crosses my mind whenever I catch myself humming-along to a tune only I can hear as I walk down a busy city street at any of the busier times of day. Especially in little old New Zealand where people can be so damn reserved with their feelings that it’s become a bit of a joke whenever they’re brought up. Have you ever seen those images floating around on Facebook or Tumblr, the inspirational quote ones, particularly the one that goes something like, “Everyone is fighting a battle you know nothing about” ? My corollary to that, is to wonder what struggles are inside us that are keeping these emotions in check, and what it would take to make breaking out in song and dance the norm. For some, it doesn’t take a lot. A few glasses of alcohol seems to do the trick for most people, which is a sad reflection of our culture that intoxication is a prerequisite to openness. For others though, all it takes is the right kind of company (eg: friends or people with whom you wouldn’t be embarrassed to sing in front of). ♪ Look at this stuff, isn’t it neat? The 3 of us looked at each other, smiling so hard, and, without skipping a beat, we continued to sing the rest of the song together, all the way through the first chorus. It was magical, and it’s that kind of magic that I wish was a lot more commonplace than it is now. ♪ Do you want to build a snowman? Unfortunately for me, lightning doesn’t strike twice. And with that, everyone else got out of their seats and headed towards the exit. I, however, stayed where I was, singing the next line by myself as I watched my friends retreat from me. A little bit of melancholy crept-in to me then as I stood from my seat to join the others, the echo of those last lyrics still ringing in my ears.